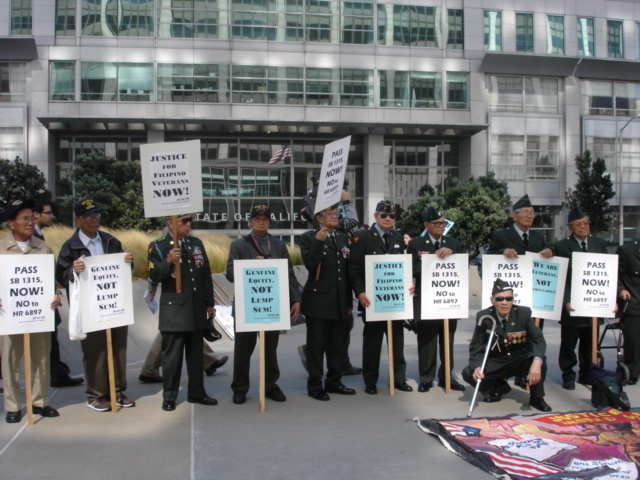 Thousands of students,scores of veterans and hundred of community advocates marched during the VETERANS DAY nationwide in Los Angeles, San Francisco, Chicago, New York and other places - NOVEMBER 8, 2008, in Historic Filipinotown, Los Angeles. The march and Community Fair started and ended at the at LAKE STREET PARK,227 N. Lake St. Los Angeles, CA 90026. The Veterans Day festivities had started at 10;30 AM at the veterans memorial with an ecumenical mass and wreath laying ceremonies. The solemn tribute started with the national anthems sung by TINIG ng UCLA and the honor guards call on the line. And then the group of community leaders laid a wreath at the memorial monument. Dr. Ben Marte and Mo Nishida led the ecumenical services. Los Angeles- Thousands of students,scores of veterans and hundred of community advocates marched and marked VETERANS DAY nationwide. Commemorative events where held from Nov. 9 to 11, 2008 all over the United States. - In Los Angeles the 8th JFAV Annual Veterans Day parade / march and Community Fair started and ended at the at LAKE STREET PARK,227 N. Lake St. Los Angeles, CA 90026. The Veterans Day festivities had started at 10;30 AM at the veterans memorial with an ecumenical mass and wreath laying ceremonies. The solemn tribute started with the national anthems sung by TINIG ng UCLA and the honor guards call on the line. And then the group of community leaders laid a wreath at the memorial monument. Dr. Ben Marte and Mo Nishida led the ecumenical services. Community leaders led by Jason Yap of People’s CORE, Jay Valencia of UHW-West, Arturo Garcia of AJLPP and JFAV and David Rockello of the GEPENC extolled the contributions of the Filipino veterans.. The World War II veterans gave their reponse led by Commander Peping Baclig, JFAV Coordinator, Lulu Astilla of AWARE and Franco Arcebal , vice president of ACFV. The guest of honor Vice Consul Daniel Espiritu also spoke about the veterans struggle for equity. Chanting "Don't say NO. NO to my Lolo, Give then Equity Now!." at 11:30 AM the parade around Historic Filipinotown followed. Around seven cars and vans loaded with more than forty veterans ,widows and dignitaries led the parade. The DANZA AZTECA led the van. Thousands of students followed chanting: Justice and equity now! No Justice and Peace! Leading the parade were the Theta Delta Beta, Delta Phi Gamma, People's CORE ,ANSWER LA with a big banner STOP THE WAR ON IMMIGRANTS. Other groups like the Search to Involve Pilipino Americans (SIPA), Pilipino Workers Center (PWC), United Healthcare Workers – West followed. Also at the parade were the Kababayan maka Bayan (KmB),Gabriela Network,UCLA Samahang Pilipino ,Kappa Psi Epsilon ,UC Irvine Kababayan ,Pilipino American Studies Kollective (Cal Poly Pomona). SMC, BARKADA CalPoly Pomona, KATIPUNAN UCR, Santa Monica College, Filipino American Community of Los Angeles (FACLA), AADAP, UNITE-HERE,LAANE ,CDIR-LA ,Echo Park Community Coalition (EPCC), Silverlake Adult Day Healthcare Center,Circulo Pampangueno of Southern California, San Diego Students,KAIBIGANG PILIPINO, (EFJP), LBCBI ,AJLPP, PANA and others. A community program followed after a light lunch was served. Story-telling with the veterans and the students was done in the afternoon. The festivities and the community program ended at around 3:30 in the afternoon. After the program, activist prepared with flags and banners to go to the anti PROP 8 rally at Sunset-Silver lake Junction later in the evening. - In San Francisco, the veterans day parade was held Nov/ Filvets rode in Hummer Jeeps and held signs for justice and equity. They were led by JFAV activists. Later, the JFAV held a commemorative rites the next day, Nov. 10 at Wolffe House in downtown San Francisco under JFAV. The guest speakers were Franco Arcebal of ACFV and Arturo P. Garcia of JFAV-LA. Other events were held in Hawaii in Nov. 6, Chicago and New York City marking the armistice day or the Day of remembrance for the veterans. 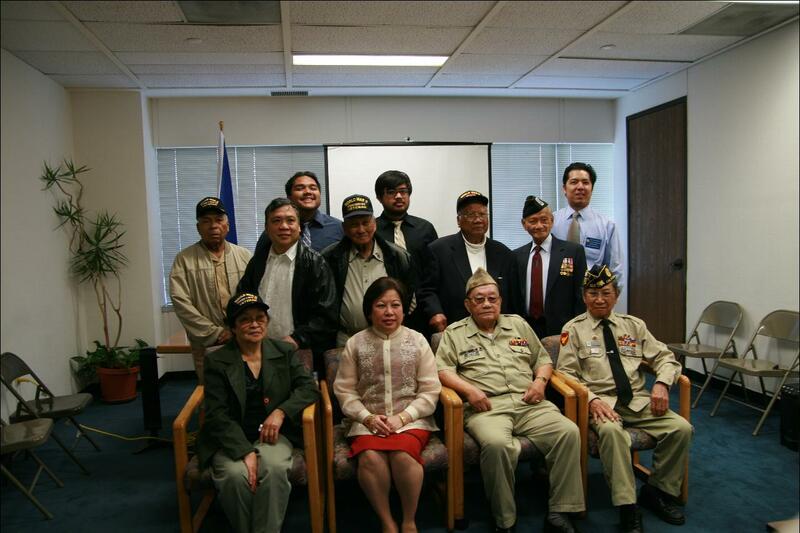 RECOGNIZE THE FILIPINO VETERANS NOW! JUSTICE AND EQUITY, NOW!